59 pages, Features tab for all of the banjo solos on each of the 15 tunes on the CD. Seven original banjo tunes written by Tom Adams. Tunings used in the tab book: 12 of the 15 tunes are in standard open G-tuning, two tunes are in C-tuning, and one tune, Lowlands of Holland, is in open C minor tuning. The material ranges from traditional bluegrass - John Henry and Worried Man Blues - to more contemporary sounds - Santa Cruz and Box Elder Beetles. Tom's arrangement of Swing Low, Sweet Chariot provides an excellent example of how to play the same tune in different keys. Starting and ending in the Key of G, the middle solo is played in the Key of C.
Three Sailors From Dublin moves through four key changes, starting in the Key of F and moving through the Keys of Gm and Dm before ending in the Key of G.
The tab varies in difficulty from less complex arrangements such as Farmer John and Brushy Creek through more challenging tunes like Santa Cruz and Ginny Whitt's. This 39-page book contains banjo tablature transcribed from the Rounder CD "Right Hand Man". The tab arrangements make each tune easily recognizable on these melody-oriented bluegrass standards. All of the tunes are in open G-tuning. While the titles will be familiar to most players, the arrangements provide an opportunity to add subtle and interesting variations to tunes you may already play. For example, Cumberland Gap and Fire Ball Mail, both based on Earl Scruggs' playing, receive a unique treatment on Right Hand Man. Boil That Cabbage Down has an added third part that takes the tune into Em before passing it back to the fiddle. From the slow triplets on Old Rugged Cross to the driving forward rolls on Bluegrass Breakdown, there's plenty of traditional bluegrass banjo playing to be learned from these 10 tunes. 34 Pages with descriptive notes on the tab and the songs. This book captures the playing style Tom used as a member of Jimmy Martin's Sunny Mountain Boys, especially the backup rolls and licks. Tom's breaks and backup reflect the excitement and energy that was a hallmark of the Jimmy Martin sound. 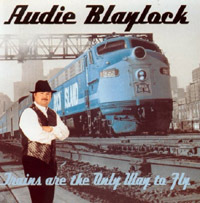 With "Trains Are The Only way To Fly" Audie Blaylock (with Tom Adams on banjo!) has created a CD filled with music straight from the Jimmy Martin school of bluegrass. Two of the songs were co-written by Martin, three others were written by alumni of Martin's band and three of the album's ten songs were recorded by Martin during his long career with Decca Records. L to R: Audie Blaylock, Ray Martin, Jimmy Martin, Tom Adams, Charlie Cline. Tom Adams with Rhonda Vincent on the 2001 album "The Storm Still Rages" on Rounder Records. Get this 49-page E-book as an Instant Digital Download from Selz. The tab includes all of the banjo breaks on the CD plus many examples of backup covering a wide range of tempos and styles. Included is open, rolling down-the-neck backup (up-tempo), two-string up-the-neck backup (medium-tempo), and bluesy triplets on a slow vocal number. Transcribed from the Rounder CD "The Storm Still Rages" recorded by Tom with Rhonda Vincent, as a member of Rhonda's award-winning (2001 IBMA Entertainer of the Year) band, The Rage. Four of the songs give the student a chance to work out the backup for songs in different keys without using a capo - backup for songs in the Keys of E, Eb, F, and F# is played while the banjo is still in open G-tuning. A bonus section includes tablature for Tom's backup on 3 songs as he played them on the band's live shows. All songs are in open G-tuning, including the hard-driving Bluegrass Express. L to R: Tom Adams, Rhonda Vincent, Mickey Harris, Audie Blaylock. Tom Adams transcriptions of the banjo playing of Jessie Baker on "Fired Up! ", the Rounder Records release by Michael Cleveland & Flamekeeper with Tom Adams on guitar and lead vocals. Get this 78-page E-book as an Instant Digital Download from Selz. Straight-ahead traditional banjo playing from Jessie Baker, one of the hot, new pickers on the acoustic scene. You get all of the recorded banjo solos on "Fired Up" plus many examples of backup for vocals and backup for mandolin and fiddle from the recording by Michael Cleveland & Flamekeeper. Tab by Tom Adams with Jessie Baker, plus descriptive notes for each of the 15 tracks. L to R: Jesse Brock, Tom Adams, Marshall Wilborn, Jessie Baker, Michael Cleveland. L to R: Tom Adams, Marshall Wilborn, Michael Cleveland, Jessie Baker, Jesse Brock.